Featuring world class skincare products from Aromatherapy Associates UK. Your absolute skincare professional will provide an in-depth skin analysis for you to create a customized facial to meet all of your skincare needs. Experience our signature aroma de-stress scalp massage to promote healthy breathing, as well as a relaxing hand, arm, neck & shoulder massage. As part of the facial we will also assist you in treating your skin from the inside out with the European technique called Face Zoning. Serious skincare without the risk of discomfort. Incredibly gentle hydration, resistance and illumination is achieved for even the most sensitive skin. Formulated with comforting botanicals and simply soothing essential oil blends. Receive radiant skin and all day environmental protection with an irritation-free promise. A full facial treatment that includes a special enzyme exfoliation, without harsh abrasives, that leaves your skin looking and feeling softer, smoother, and more radiant. Fruit acids of pineapple, passion flower and grape work together to remove dead skin cells, while carrot oil, rich in Vitamin E and antioxidants, help to diminish the signs of aging. Skin is left beautifully glowing with an even tone appearance. A combination of vitamins, minerals, enzymes, amino acids, and most importantly, PURE OXYGEN, are united and misted onto the skin. This is a great elevation to any of our Signature Experiences. The perfect elevation for any facial. This deluxe eye experience smooths fine lines and wrinkles by using chamomile and cornflower to soothe, calm, and decrease puffiness. This treatment includes a gentle cleanse, specialized massage, and treatment mask on the eye area, followed by the application of award-winning Aromatherapy Associates Eye Cream with deeply hydrating soy proteins. This treatment gives immediate, tangible results to ensure every guest leaves with visibly improved natural radiance and glowing, healthy skin. The Aroma Radiance Lift AA treatments help in the battle against aging, but also to give clients the extra confidence and leave them feeling their absolute best for a special occasion or night out. Laser-cut diamond particles smooth and refresh the skin. Experience a gentle, modern, dust-free approach that invigorates cell renewal and creates a healthy, balanced surface. Laser-cut diamond particles smooth and refresh the skin. Experience a gentle, modern, dust-free approach that invigorates cell renewal and creates a healthy, balanced surface. Combined with the patented technology of SilkPeel, you achieve several benefits in a single procedure, helping you to achieve more youthful skin in less time. See noticeable improvements with every session. Choose from one of the following 4 solutions for the best possible results or have your SilkPeel certified technician assist you in making the best choice! Our Oxygen Facial is the first to offer both corrective and preventative skin care, especially when it comes to reducing the effects of aging caused by the sun, free radical damage, and exposure to pollutants. After cleansing and toning treatments, a combination of vitamins, minerals, enzymes, amino acids, and most importantly, PURE OXYGEN, are united and misted onto the skin. This combination leaves the skin healthy, rejuvenated, and glowing. Reduce the appearance of cellulite, uneven texture, and stretch marks with SilkPeel Dermal Infusion for the body! Each session works on one area (legs, arms, back, or stomach). See noticeable improvements with every session. The aromatherapy experience is more than a massage using essential oils, it is designed to work directly with your nervous system and has extremely positive results for the mind, body and soul. Inhale, sample and choose your favorite Aroma Blend, prior to your absolute experience, and then enjoy the personalized benefits as the oils are utilized throughout your massage. This treatment starts with a consultation to find out what your emotional and physical needs are. From that we carry out an aromatherapy smell test to allow you to choose the oil most suitable for you. This hero treatment releases tension held in every part of the body, leaving you feeling deeply relaxed and re-charged. Carefully applied pressures stimulate the nervous system, Swedish and neuromuscular massage techniques relieve muscular tension and lymphatic drainage helps encourage a healthy circulation. Stresses and strains are dissolved away. Our Ultimate Aromatherapy Experience paired with a relaxing foot soak, and mini facial. Perfect for times of stress and over-activity, this treatment helps the mind unwind and refocus, getting you back on track. Relax with a de-stress massage formula while tension is released with an upper back, neck, and shoulder massage. The massage is followed by the application of warm paraffin wax that assists in easing tight, sore muscles. This is a great massage for those who work at a computer, drive a lot, or are frequent flyers. The master healers of Hawaii practice Lomi Lomi “Loving Hands” massage. This treatment is a gentle light pressure massage that mimics the movement of waves, soothing muscles with continuous flowing strokes, while totally nurturing the body and relaxing the entire being. Features organic and natural Whish Coconut Massage Oil- Aloha! Feel the benefits of smooth B.C. river stones working deep into your muscles, during a Swedish style massage that will soothe tension, as they warm to your individual body temperature. Beautiful British Columbia’s pinnacle of relaxation! A unique Shower experience where you lay relaxed on a table while multiple shower heads above cascade water down like a waterfall. A great relaxing addition to anybody treatment! A relaxing quick soak in one of our hydrotherapy tubs is the perfect way to begin your relaxation journey. 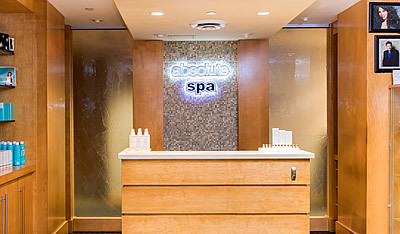 Enjoy before or after any absolute spa experience. The application of warm paraffin wax after any treatment will assist in easing tight, sore muscles, while simultaneously hydrating and nourishing the skin. 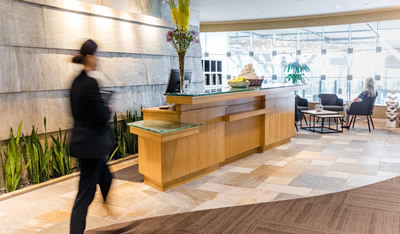 Performed by highly qualified and registered massage therapists trained to treat and aid in the prevention of pain, injuries and physical disorders. Full consultation and home care is included in the treatment time. *Please request medical receipt at the time of booking. Treat yourself when you need it most. A special pregnancy pillow is set up to provide total comfort so that expectant moms can re-energize and find relief from those aches and pains. You deserve it! Performed by a Registered Massage Therapist. *All expecting moms-to-be must be past their first trimester. Indulge in pure nourishment and deep hydration. Begin with an invigorating body exfoliation using ground olive pits. Rich oils and creams of Damask Rose are smoothed onto freshly exfoliated skin. Evening Primrose Oil hydrates while Neroli and Roman Chamomile soothe, leaving you radiant and revitalized. Peppermint clears and strengthens natural healing for sinus and headache sufferers. The natural anti-bacterial powers of Tea Tree and Eucalyptus open airways to maximize effective breathing and promote a strong immune system. The exquisite, natural ingredients of jasmine, neroli, vetivert and geranium are smoothed onto freshly exfoliated skin, creating an uplifting and soothing aroma for any special event. Experience a full body exfoliation, followed by a unique Vichy Shower experience where you lay relaxed on a table while multiple shower heads above cascade water down like a waterfall. Enjoy this relaxing back treatment that helps to improve skin’s texture and skin tone. Also aids in purification, treats acne prone skin, and relieves congested pores. Your absolute skincare professional will personally select the correct Austrian Moor Mud facial products for your skin. The potent products are made with 30,000-year-old mud, rich in over 100 herbs and minerals to purify your skin and pores. Naturally sourced ingredients combined with the nutrient rich moor mud enhance your skin’s ability to regenerate. A personalized combination of therapies: Begin with Herbal Bouquet, an odorless, taste free beverage to cleanse your internal system. Start the body treatments with the Vital Chi Dry Skin Brushing System, to optimize the absorption of the Moor Mud, followed by a Moor Mud Body Wrap, with more than 100 organic herbs, plants and flowers, and then a ‘Skinny Bath’ Water Spa Therapy Soak. Finish off with the application of Moor Spa Body Lotion, for head to toe detox and hydration experience. 100 % Pure Moor Mud detoxifies, re-mineralizes, balances hormonal changes and helps with inflammation. The organic healing moor mud also helps chronic conditions such as arthritis, muscular aches and psoriasis. It is also an ideal treatment for water retention and cellulite. Enjoy our Signature Aroma De-Stress Scalp Massage and finish with the application of a body cream or oil of your choice. 100 % Pure Moor Mud detoxifies, re-mineralizes, balances hormonal changes and helps decrease inflammation. The organic healing of moor mud also helps chronic conditions such as arthritis, muscular aches and psoriasis. It is also an ideal treatment to reduce water retention and those concerned with cellulite. Experience the benefits of Thalassotherapy. Blue Green Algae and Sea Kelp are powerful antioxidants which may help stimulate your metabolism. Skin is nourished with healing Rosehip Oil, also rich in Vitamin C, while high potency Seaweed improves its condition. A soothing spa manicure which features 30,000-year-old mud, rich in over 100 herbs and minerals, to heal and restore your skin. Naturally sourced ingredients combined with the nutrient rich moor mud enhance your skin’s ability to regenerate. Finish off with a warm paraffin wax treatment to seal in the moisture! A soothing spa pedicure which features 30,000-year-old mud, rich in over 100 herbs and minerals, to heal and restore your skin. Naturally sourced ingredients combined with the nutrient rich moor mud enhance your skin’s ability to regenerate. Finish off with a warm paraffin wax treatment to seal in the moisture! Perfect for lackluster or damaged hair, our thermal masque helps to re-establish balance in your hair and scalp and helps prevent hair loss by stimulating blood circulation to the hair follicles. *Suitable for dark hair only. Hydrotherapy is used successfully to ease sore muscles, relieve stress, and reduce edema. Reduce stiffness and increase relaxation with your choice of Aromatherapy Associates oils. Enjoy our Signature De-Stress Scalp Massage and finish with the application of a personally chosen body cream or oil. A delightful spa manicure which includes your choice of products from the popular Whish collection. Choose from Pomegranate, Lavender, Lemon Grass, Coconut Body Butter and Sugar Scrub for your massage and exfoliation. This is a full manicure which includes soaking of the hands, exfoliation and massage up to the elbow, shaping, trimming, and buffing of the nails, cuticle work, and application of your choice of OPI nail lacquer. A hand soak in Moroccan Rose tonic water, exfoliation with natural ground olive pits, and a warm, deeply hydrating Renew Rose mask, all followed by a relaxing hand and arm massage with aromatherapy essential oils. Complete the experience with application of your choice of OPI nail lacquer. A delightful spa pedicure which includes your choice of products from the popular Whish collection. Choose from Pomegranate, Lavender, Lemon Grass, Coconut Body Butter and Sugar Scrub for your massage and exfoliation. This is a full pedicure which includes soaking of the feet, exfoliation and massage up to the knee, shaping, trimming, and buffing of nails, cuticle work, foot filing, and application of your choice of OPI nail lacquer. Includes soaking of the feet, exfoliation and massage up to the knee, shaping, trimming, and buffing of nails, cuticle work, foot filing, and application of your choice of OPI nail lacquer. This pedicure includes use of specialized Gehwol products that target specific foot care problems. Every prescription pedicure includes the retail product used during treatment. Sit back in comfort and soak your feet in Moroccan Rose tonic water, followed by exfoliation up to the knee and a Renew Rose hydrating wrap to soften and nourish the skin. A soothing massage will encourage circulation and help reduce lower leg swelling and fluid retention. Complete the experience with application of your choice of OPI nail lacquer, you’ll leave with an extra spring in your step! Reduce fluid retention quickly with Pink Grapefruit, Juniper Berry, and Rosemary. This treatment is stimulating, purifying and encourages elimination. It includes specialized massage techniques for healthy circulation and is excellent for tired legs and preventing deep vein thrombosis. Full manicure and pedicure performed by two professional technicians at the same time, at a pedicure station. 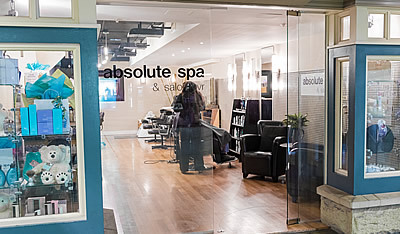 Please note that absolute spa only provides body waxing. No facial waxing is available. Featuring the famous Au Courant spray tan solution, which is a synergistic blend of botanicals and vitamins. The product is designed to enhance the elasticity of your skin while simultaneously creating the most natural looking faux tan. Customize your color for a light sun-kissed look or a deep dark golden tan. This is applied using an airbrush technique by an absolute spa professional technician. Includes arms, abdomen, chest and back. A natural looking tan from the waist up – perfect for that strapless dress. Want a defined six-pack? We can also contour your abs to provide a more defined look! Includes legs and buttocks. Want great summer legs? Our tan instantly firms! Get your shorts and skirts out. For your safety and skin’s protection we only provide brow tweezing or threading. We do not use hard or soft wax on the face. Youngblood is the premier luxury mineral cosmetic made of natural, finely ground minerals from the earth – without any of the common irritants, such as chemicals, dyes and preservatives, found in conventional make up. Created by medical esthetician Pauline Youngblood for use after facials and post-surgical procedures. 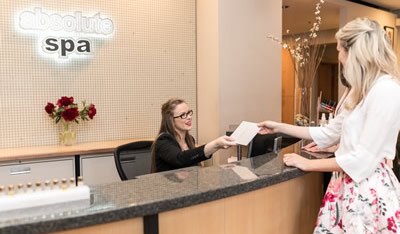 Absolute spa offers a complimentary make-up touch up, after any spa experience, to freshen you up before you head out our doors! Refinery is inspired by the renowned men’s grooming salon in London. This exclusive product range combines aromatherapy expertise with the unique knowledge of specialized male grooming. This facial is designed for any age. The skin is soothed, calmed and protected from aggressive environmental stresses. Pop in for a quick lunch time facial! A shortened version of our gentleman’s facial, great for any guy on the go looking for a quick cleanse, exfoliation, and moisturization, to get you through the work week with strengthened and fresh feeling skin. Enjoy this relaxing back treatment. Helps to improve skin’s texture and skin tone. Also aids in purification, treats acneic skin and relieves congested pores. 100 % pure moor mud detoxifies, re-mineralizes, balances hormonal changes, and helps inflammation. This organic and healing moor mud also helps chronic conditions such as arthritis, muscular aches and psoriasis. It is also an ideal treatment for water retention and cellulite. Enjoy our Signature Aroma De-Stress Scalp Massage and finish with the application of a personally chosen body cream or oil. A full body exfoliation that gives a gentle yet thorough exfoliation. As a precaution to our guests who are expectant mothers, we have a menu below with safe treatments that can be performed during pregnancy. Have fun and stand out from the crowd with a deluxe teen manicure. Our talented nail technicians will shape, buff, exfoliate, massage, and finish off with an application of your favorite OPI nail lacquer. This dream teen pedicure will dazzle any young woman’s toes. Feet will be soaked then exfoliated and massaged. Nails are shaped and buffed. Choose from one of OPI’s funky, bright, sparkling, or natural nail lacquers and experience absolute delight. Our personalized natural treatment for teens prevents breakouts and heals with Lavender, while Clay relieves skin of excess oils. Antiseptic pettigrain and antibacterial tea tree are clear skin warriors. This treatment is for our guests aged thirteen to nineteen. Learn from the Pros as they use our Youngblood mineral make-up to create your perfect look. Lots of sparkle and shimmer to choose from! Bring your own makeup too! Receive helpful tips and tricks to achieve the perfect makeup look for yourself, at home. Have one of our pros create the perfect arch to frame your face! Perfect for that special occasion or school photos.